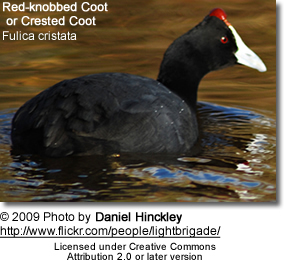 The Red-knobbed Coot or Crested Coot (Fulica cristata) belongs to the rail and crake family. They can be found in much of Africa - specifically northern Morocco, East Africa and the southern part of the continent from Angola and the Democratic Republic of the Congo (formerly Zaire) through to South Africa, also Madagascar; as well as the southernmost part of Spain. They inhabit freshwater lakes and ponds. They are common on open water, but mostly confined to the West. They are rare on the coast and absent from the arid desert regions. They usually form flocks which range in size from small groups of 10-12 individuals to larger, loose-knit groups. Outside the breeding season, these gregarious birds can be seen in extremely large numbers (mostly groups of 20 - 300, but up to 1,000 or more have been recorded). This species is both sedentary and nomadic, often making local movements in response to rainfall, water levels and the availability of food. 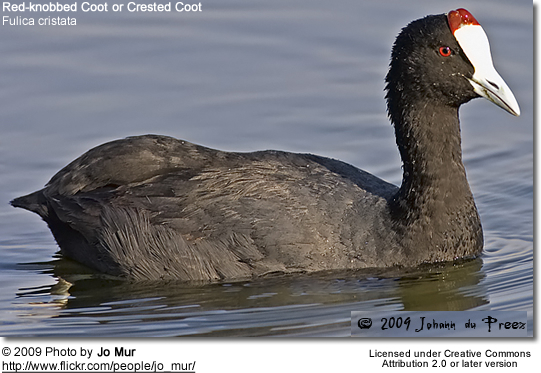 The Red-knobbed Coot is largely black except for the white facial shield. As a swimming species, it has partial webbing on its long strong toes. During the breeding season the adults develop two dark red knobs at the top of the frontal shield. Outside the breeding season these are reduced in size and not as brightly colored. The juvenile is paler than the adult, has a whitish breast, and lacks the facial shield. They adult plumage develops when they about 3 to 4 months old, but the white shield is only fully developed at about one year of age. 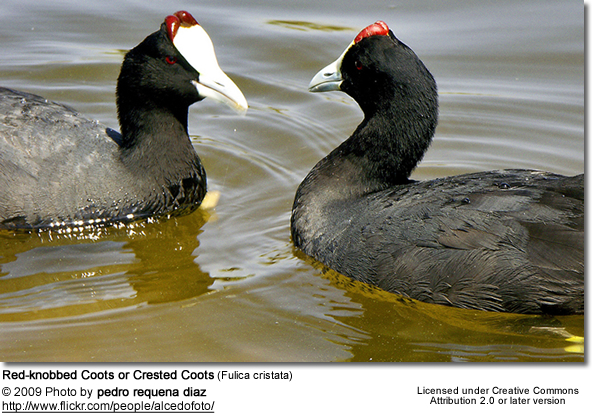 Similar Species ID: This species is easily confused with the Eurasian Coot as their range overlaps. 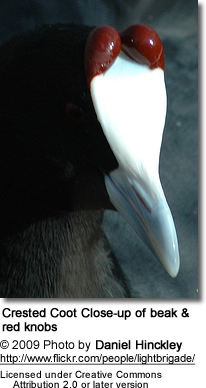 There are two tiny red knobs at the top of the facial shield, which are not visible at any great distance and are only present in the breeding season; the black feathering between the shield and the bill is rounded, whereas in Eurasian it comes to a point; and the bill has a bluish grey tinge. These Coots builds their nests on dead reeds near the water's edge or afloat. The female lays up to 8 eggs. This is an aggressive species, and very territorial during the breeding season. 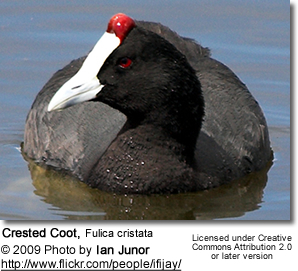 The Red-knobbed Coot is usually seen swimming on open water or walking across waterside grasslands. It is an aggressive species, and is particularly territorial during the breeding season. This rail is reluctant to fly and when taking off runs across the water surface with much splashing. 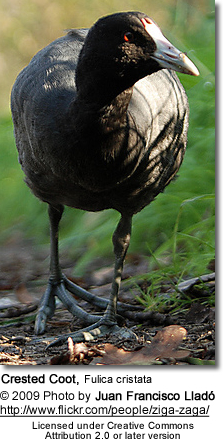 This Coot is an omnivore and will take a variety of small live prey, including the eggs of other water birds. Its vocalizations include a fast kerrre and a harsh ka-haa. This species is generally noisy.